Big economic development deals announced over the last two years are coming to fruition in the Roanoke and New River valleys, even as other companies are shutting down and scaling back. Ardagh Group, a food packaging manufacturer; Korona S.A., a Polish candle maker; Red Sun Farms, a Mexican greenhouse tomato grower; and Falls Stamping & Welding Co., which provides metal stamping for the automobile industry, all have begun to hire and ramp up production. Other employers are expanding their existing operations. Volvo Trucks North America is adding 200 jobs at its Pulaski County plant, and Altec Industries Inc., another truck-related company, is adding 203 in Botetourt County. Virginia Transformer Corp. is expanding its Roanoke facility to a new, 25-acre site in Botetourt, eventually creating 150 jobs. Indeed, manufacturing has contributed the most to employment growth in the region during the past four years, according to Bureau of Labor Statistics figures provided by the Roanoke Regional Partnership. That employment sector is trailed by education and health, professional services and finance, in that order. Health care remains the biggest economic driver in the Roanoke and the New River valleys. Carilion Clinic is Western Virginia’s largest employer, and another hospital chain, Hospital Corporation of America (HCA), which operates LewisGale Regional Health System, is a major employer as well. Yet there have been setbacks. BB&T Corp. is closing its Roanoke call center, eliminating 140 jobs. Caterpillar Global Mining closed two regional facilities for a total of 285 jobs lost. Another 250 employees lost their jobs when Grede idled its foundry in Radford. Recent job gains and losses have had a mixed effect on area unemployment rates. The Blacksburg area’s jobless rate was 6.2 percent in August, unchanged from July, while the rate was 6.1 percent in the Roanoke area in August, up from 5.6 percent the month before. Dennis Cronk of commercial real estate group Poe & Cronk says that 2014 has been his firm’s best year for marketplace activity. He notes, however, that inventory has been shrinking. Industrial parks and prime commercial spaces have filled, leaving some companies bursting at the seams but unable to expand due to lack of capacity. One of the companies that has found space is Korona Candles. Agnieszka Fafara, the president and CEO, says the Polish company decided to build its factory in Pulaski for two reasons: It met geographical and climatic criteria for manufacturing and shipping its product, and its proximity to higher education. “Our production is pretty advanced, so we need skilled workers and engineers to be employed here,” she said. Like Korona, Ardagh Group chose to locate a large manufacturing facility in the region because of geography. It needed a site that met a long list of criteria, including access to the ConAgra Foods plant in Newport, Tenn., one of its bigger clients. That contract also created the need for haste, which resulted in Ardagh’s decision to locate in the former Hanover Direct building in Roanoke County. Ardagh’s facility, which opens in November, will produce about 4.5 million cans per day and create 96 full-time jobs within two years. Red Sun Farms, the first tenant of the New River Valley Commerce Park in Pulaski, began harvesting its first fruits this fall. 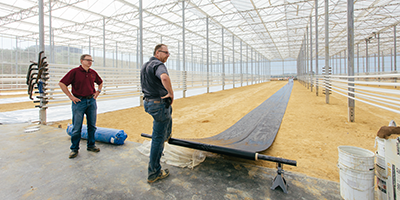 Director of Operations Jay Abbott estimated its workers will harvest more than one million pounds of greenhouse tomatoes by January. The NRV Commerce Park remains one of the few regional industrial parks with plenty of room to grow. The 1,000-acre property is planned for sites 75 acres or larger, with the anticipation of hosting up to five businesses of that size. Brian Hamilton, Montgomery County economic development director, says the 175-acre Falling Branch Corporate Park has picked up a new building or two every year since 2011. Inorganic Ventures, a chemical company that moved to the park in 2008, expanded in 2012. That same year, BackCountry.com built there and now employs 180. In 2013, both Aeroprobe Corp., which makes instruments and software for cars, jets, wind turbines and other applications, and Polymer Solutions, a lab for polymer, materials and metals testing, moved in. It’s the same story at Blacksburg Industrial Park, now in its fifth expansion to accommodate TORC Robotics, which, like Polymer Solutions, is growing out of Virginia Tech’s Corporate Research Center. That leaves three available sites before it reaches capacity. Christiansburg Industrial Park already is full. That shrinking industrial space is driving regional cooperation and creativity. It’s why 13 localities banded together as a regional industrial facility authority to create the NRV Commerce Park. It’s also why six Roanoke Valley localities have formed the Western Virginia Industrial Regional Facility Authority to identify large potential economic development sites and allow for partnerships between local governments to split costs and share the benefits. A steadily shrinking amount of property is also pushing governments and individual developers to think outside the box. Roanoke city worked first to reinvent its downtown and now is expanding it beyond its traditional confines. The city partnered with Carilion Clinic and Virginia Tech to redevelop large chunks of land near the Roanoke River. Parcels previously occupied by industrial development now house the Virginia Tech Carilion School of Medicine and Research Institute — which in May graduated its first 40 doctors — a Cambria Suites hotel and a mixed-use development known as The Bridges, which will mix parks, commercial business and apartments for an estimated build-out value of $150 million. Aaron Ewert, project manager at The Bridges, says the first residents have already moved into the new apartment building. A Starbucks coffee shop and restaurant are moving into a historic lumber warehouse, and JDS Uniphase Corp., which develops software and instruments, is moving into a former trolley barn. Four more historic buildings are slated for commercial retail, and contractors are building a riverwalk, kayak launch and stage. On the northern edge of downtown, private developers await the build-out of an interchange that will provide interstate access to the biggest parcel of undeveloped land in Roanoke, which sits across I-581 from Valley View — its most popular retail destination. Closer to downtown’s heart, just a few blocks from the newly renovated Elmwood Park and its new amphitheater, developer Faisal Khan is finding ways to turn potentially difficult historic buildings into new apartments. In August he formally opened the former Crystal Tower building, renamed the Ponce de Leon, as a nod to its past as a hotel of the same name. The restored art deco building includes 90 apartments, 87 of which were leased as of mid-September. Nearby, Khan is tackling an even bigger challenge with a former YMCA. The building has neither the ornate majesty of the Ponce de Leon nor the fashionable, exposed brick of warehouse-based projects, but instead was built with block concrete. It includes small, upper-floor dorm rooms and outdated athletic facilities that must be structurally preserved to obtain historic tax credits that make the financing work. Khan hopes to take advantage of those potential challenges by making them a selling point. He’s turning the building into 56 apartments and 15,000 square feet of workout amenities, naming the development “the Locker Room” for its old lockers, which will be incorporated into living spaces, and marketing it all to an athletic demographic. “Being creative in how we lay it out and being creative in keeping amenities gave the project an identity it may not have had,” Khan says. That creativity, playing out at the individual, company and governmental levels, may well help the Roanoke and New River valleys continue to forge a regional economy that continues to reinvent itself, too.